E-cigarettes, also called vape pens, were once heralded as a much safer alternative to traditional cigarettes, and a way for smokers to either kick the habit or decrease cancer risks. Because e-cigs are available in a wide array of flavors and devices (some look like pipes, others like cigarettes, and many look like futuristic gadgets), many members of the public grew concerned of the e-cig’s potential appeal to youngsters. The FDA released statistics corroborating this fear: in “2013-2014, 81% of current youth e-cigarette users cited the availability of appealing flavors as the primary reasons for use.”, and that “e-cigarettes . . . [w]ere the most commonly used tobacco product among youth” in both 2014 and 2015. While these statistics might raise eyebrows by themselves, a new use for vape pens is becoming increasingly more widespread. CNN published a story on vape pens being used to as a vehicle to consume illegal drugs like flakka, methamphetamines, heroin, and marijuana. “Water-soluble synthetics are easily converted into liquid concentrate that can go into the device cartridges and be vaped just like nicotine and other legal substances.” This makes it difficult for law enforcement officers to detect if illicit drug use is occurring or whether an e-cig simply contains flavored tobacco oil. Police have a harder time establishing probable cause because of the uncertainty of an e-cig contains nicotine, or something worse. Furthermore, this masked consumption has also resulted in people unknowingly consuming, and in some cases overdosing, on illegal drugs the user unknowingly consumed. 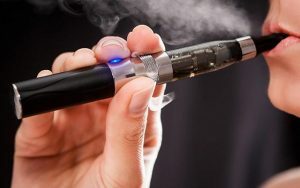 Researchers at Virginia Commonwealth University received a grant from the Department of Justice to explore “how drug users are increasingly using e-cigarette devices to vape illicit drugs.” Users pass on this knowledge via online drug forums and YouTube tutorials, explaining how meth can be consumed in the workplace, with no one the wiser. What’s more, social media users and celebrity culture are endorsing vape pens as a discreet way to get high in public, in school, or in the workplace. The research team is testing the efficacy of vape pens in delivering drugs like meth, heroin, marijuana, and others to the user. That vape pens are effective is indisputable given the wide-spread consumption of drugs through the devices – what the researchers are measuring is the dosage levels transmitted in the vapor clouds and analysis of the “commercially available e-liquids to see if the purported contents matched the labels.” The researchers found wide discrepancies between ingredients listed on the labels and what the e-liquids actually contained. Some e-liquids contained drugs that labels specifically claimed they did not contain, prompting the researchers to cite major concern over the lack of regulatory labeling oversight. The Food and Drug Administration has responded to some of these concerns with increased regulation over the e-cigarette industry. One of these regulations requires “federal approval for most flavored nicotine juices and e-cig devices sold in vape shops.” What remains to be seen, however, is how the FDA responds to the use of e-cigs for their as a vehicle for consuming illicit drugs. See Sara Ganim & Scott Zamost, Vaping: The latest scourge in drug abuse, CNN, (last visited Sept. 5, 2015) http://www.cnn.com/2015/09/04/us/vaping-abuse/. Vaporizers, E-Cigarettes, and other Electronic Nicotine Delivery Systems (ENDS), Food and Drug Admin. (last visited Feb. 13, 2017) https://www.fda.gov/TobaccoProducts/Labeling/ProductsIngredientsComponents/ucm456610.htm#regulation. Brian McNeill, Shedding light on a vaping trend: Researchers study the use of e-cigarettes for illicit drugs, Va. Commonwealth Univ. News (last visited Feb. 22, 2017) https://news.vcu.edu/article/Shedding_light_on_a_vaping_trend_Researchers_study_the_use_of. See Laurie Tarkan, How new rules could kill the vaping boom, Fortune (last visited Sept. 29, 2015) http://fortune.com/2015/09/29/vaping-fda-rules/.